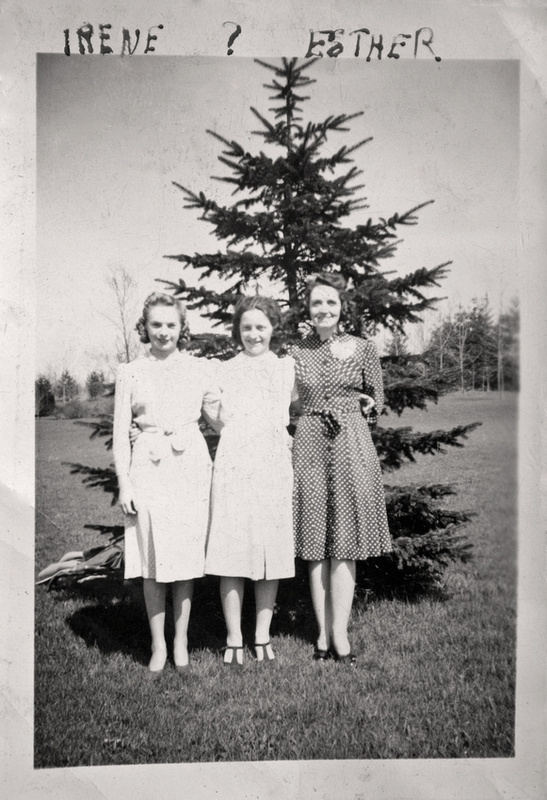 This photograph of Murosky relatives was included in the Helen Tillie Bukowski Collection. The Murosky relatives included in the photograph are Irene Chanis and Esther Murosky. Esther Murosky is the sister of Margaret Murosky, Irene's mother. Margaret and Esther are the daughters of Anthony Murosky, Sr. and Eva Zielinski. The third woman in the photograph is currently unknown. The photograph may have taken in the 1940's. The ladies are wearing shaped polka dot dresses with ties at the waist. The shape and style of the dress is similar to dress styles from 1942. The only difference is the ladies are wearing dresses with a tie in place of a belt. The location of the photograph is currently unknown. To view another photograph of Irene Chanis taken in 1937 visit this link. To view photographs of Esther Murosky taken in 1937 visit this link. The photograph was included in the Helen Tillie Bukowski Collection. It is currently unknown how Helen received this photograph as the writing on the photograph is unknown. Helen was married to Anthony Harry Murosky, Jr. Anthony was the brother of Esther Murosky and the uncle of Irene Chanis. Photographer Unknown. Editing and digital restoration by Michelle M. Murosky. Margaret Murosky and Esther Murosky are my 2nd great aunt. She is the sister of Anthony Harry Murosky, Jr. my great grandfather. Anthony Harry Murosky, Jr. married Helen Tillie Bukowski. Their son Arthur is my paternal grandfather. Margaret's daughter Irene Chanis is my 1st cousins 2x removed.